An SAE program is the actual, hands-on application of concepts and principles learned in the agricultural education classroom. 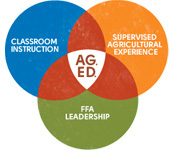 Students are supervised by agricultural education teachers in cooperation with parents, employers and other adults who assist them in the development and achievement of their educational and career goals. In order to be considered for the BH FFA Show Team, one must exhibit in or be entered in at least 5 of the above BH FFA Chapter sanctioned shows in one year. To be awarded a BH FFA letter jacket, please refer to the FFA Handbook for rules. There are many shows throughout the year that an exhibitor may exhibit their livestock projects individually. The Showbox www.theshowbox.com and your breed associations put out publications for upcoming shows you may choose to attend individually. You can also keep up with upcoming prospect shows by going to Mr. Otto's Texas Prospect Shows on Facebook too!